Over the past few years, books like Michael Pollan’s In Defense of Food and documentaries like Food Inc. have increasingly challenged us to ask: How much do we really know about the “food” we buy and consume on a daily basis? 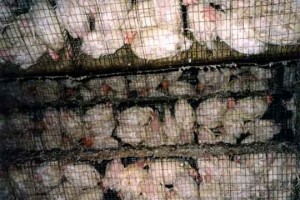 Cramped conditions on factory farms have led to high levels of disease among the animals. 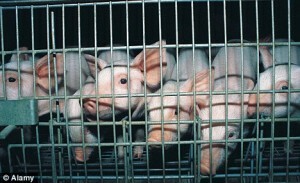 Pigs, for example, are increasingly treated with antibiotics. These taboos suggest that our cultural and social familiarity with animals guides our thinking about the treatment of the animals we eat. In North America, we are divorced from the conditions in which the latter live and die for our consumption more than ever before. Our relationship to animal food has a rich, complex history. Be it animal torture, testing or human methods of breeding and killing fish, cows, pigs or chickens for our consumption, reformers have long campaigned for the rights of animals. Within the broad humanitarian reform campaigns against slavery, vice, and child labour in the late eighteenth and early nineteenth centuries, William Wilberforce and his contemporaries founded the Society for the Prevention of Cruelty to Animals. This first animal welfare organization would later become the Royal Society for the Prevention of Cruelty to Animals (1824). In 1809, two years after the legal abolition of the slave trade in Britain, Wilberforce presented a Cruelty to Animals Bill to the House of Commons. 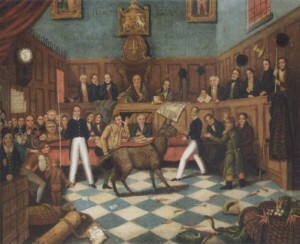 He and his contemporaries lobbied Parliament throughout the nineteenth century against animal baiting, cruelty and experimentation. Irrespective of our individual perspectives on this issue, we are facing sobering collective realities. Consider three: environmental, health and job quality concerns. Animal agriculture currently makes a 40% greater contribution to global warming than all transportation in the world combined. Nearly one-third of our earth’s land service is dedicated to livestock. The polluting strength of manure resulting from factory farmed animals is approximately 160 times greater than that of raw municipal sewage. In spite of this, limited waste-treatment infrastructure is in place. Further, studies have shown that those living nearby factory farms experience sore throats, coughing, runny noses, diarrhoea and abnormal levels of tension, depression, anger, fatigue and asthma, especially among children. Research also shows that the more meat one eats, the more likely one is to die of heart disease, cancer and stroke. Lastly, skilled farmers continue to be replaced with wage and contract “line workers” who, according to preliminary reports, are experiencing higher levels of stress and on-the-job injuries. In spite of these concerns, global meat consumption is predicted to double by 2020, and countries like China and India are adopting Western methods of factory farming in order to supply their growing middle classes with meat and eggs. Today, perhaps more than ever before, we are morally bound on multiple levels to consider: When is eating animals a good idea? Is it ethical? I firmly believe that we should all be asking ourselves these questions. Even if only for our own health, we should take it upon ourselves to know the origins of our food. I really enjoyed reading the bit about the history of animal rights – thank you for the historical background. The approach I’d like to embrace on this topic is less degrees of separation between the food I consume and myself, as recommended in Michael Pollan’s In Defense of Food and Food Inc. I think it will help me make the mental connection that the “meat” I’m consuming was once a living and breathing being, and I will be more aware of how much of it I consume and at what cost to others. Of course – as you know – my ultimate hope is to have my own hobby farm, but I have a feeling I’ll have a very hard time eating animals that I’ve witnessed being alive! It’s a very informative paper. Now I understand why there are so many people like Eyal who have become vegetarian. I do contribute to PETA and receive their journal. It would be difficult to become vegetarian, but I plan to further decrease my personal consumption of meat and to spread awareness of what is happening globally regarding the meat and fish industry. Thanks Karlee for this good post. I recently borrowed a book from the library on Family Vegetarian Recipes. I had been thinking about cutting down on meat. And your post here is so timely for me. It gives me more motivation to eat less meat. Excellent article. I’ve been thinking about becoming a vegetarian. this may push me over the edge. Great work, once again, Karlee! I completely agree that we eat too much meat. Hopefully, people will understand that it is healthier for ourselves and for the environment to eat less, but higher quality meat from animals that were treated humanely. You will excuse my non-academic stance, but this is a lot of BS. First, whatever veganism Donald Watshisname invented was only in terms of ‘rational’ consideration. For refined atheists who haven’t got a clue about history, let me mention that Christians have been fasting on fruits and vegetables for centuries (especially Eastern Orthodox Christians) – there is more to it than just eating healthy. In case you’re wondering, simply google Christian fasting. Second, to paraphrase Orwell, if we as humans are equal to animals (which, to some minds, we are because we’re just evolved monkeys, aren’t we), how would you think about animals killing us for a change? How fortunate they don’t have knives, eh. Or the ability to handle them. Fourth, there’s a joke about pork being the best vegetable. Ask the growing Chinese middle-class (speaking of the Chinese miracle which everybody is presently praising). Come on, people. Wake up, grow up an don’t just keep repeating same stuff like parrots. “Humane killing?” I don’t know how a writer, someone concerned with words, can write the phrase with a straight face. Put up or shut up. Go vegan.